Leukocyte immunoglobulin-like receptors A/B (LILRA/B) represent a family of immunoregulatory receptors expressed by a range of hematopoietic cell types1. The LILRB subset contains immunoreceptor tyrosine based inhibitory motifs (ITIMs) also found on other promising immune checkpoint targets such as PD-1, BTLA, and TIGIT. LILRB ligands include MHC I, S100A8/A9, and some myelin-associated proteins. Some recent evidence has also indicates Angiopoietin-like (ANGPTL) proteins may be soluble ligands for LILRB2. Our new, unpublished experiments suggest interactions between ANGPTL proteins and LILRA/B may be more widespread than originally thought and provide new avenues for immune checkpoint research. Research in understanding the roles of Angiopoietin-like (ANGPTL) proteins in immunology is in its infancy. One reason has been a lack of quality tools to study their activity. 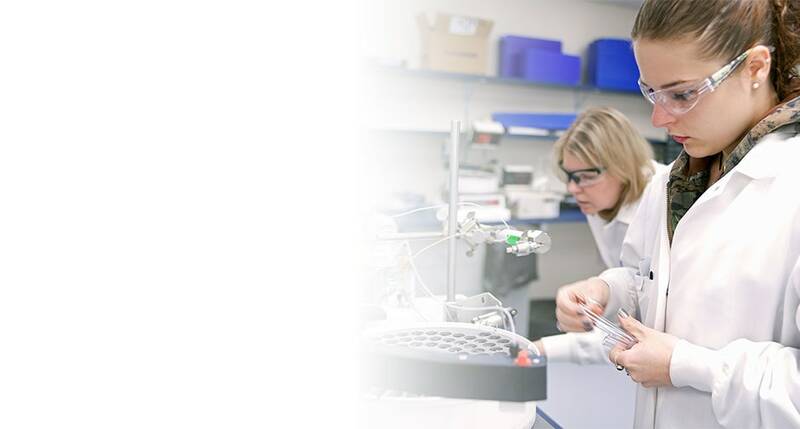 R&D Systems scientists have produced a range of purified ANGPTL proteins that are now available (Table 1). Their research has utilized these reagents to demonstrate previously unreported associations between Angiopoietins and ANGPTL proteins with LILRA/B receptors. The results suggest new functions for these proteins and reveal unexplored areas of immunology. Figure 1. 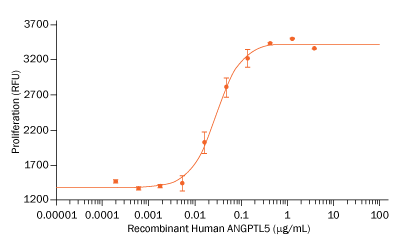 Recombinant Human ANGPTL5 (Catalog # 6675-AN) Induces Proliferation in Primary Rat Liver Mononuclear Cells. ANGPTL5 enhances proliferation of E16 rat liver mononuclear cells in the presence of Recombinant Mouse SCF/c-kit Ligand (Catalog # 455-MC), Recombinant Mouse Thrombopoietin/TPO (Catalog # 488-TO, and Recombinant Mouse Flt-3 Ligand (Catalog # 427-FL). Angiopoietins [Angiopoietin-1, Angiopoietin-2, Angiopoietin-3 (mouse), Angiopoietin-4 (human)] and ANGPTL1-8 are secreted glycoproteins with roles in angiogenesis, lipid metabolism, hematopoietic stem cell expansion, and inflammation (Table 2). 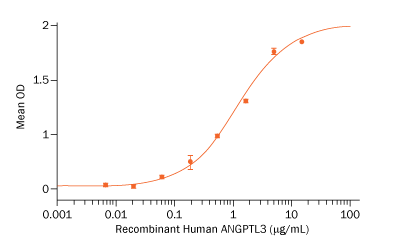 R&D Systems full length ANGPTL3, ANGPTL4, ANGPTL5, ANGPTL6, and ANGPTL7 recombinant proteins all exhibit bioactivity as expected in accordance with published literature.7 Typical data showing ANGPTL5-induced proliferation of primary rat liver mononuclear cells is shown in Figure 1. Structurally, ANGPTL proteins all contain an N-terminal coiled-coil domain that mediates oligomerization and a C-terminal fibrinogen-like domain. ANGPTL8 is the only exception and is lacking the C-terminal domain. We also have found that truncated versions containing the N-terminal coiled-coil domain of recombinant ANGPTL3 and ANGPTL4 share similar bioactivity to the full length protein (not shown). In order to evaluate new interacting partners for ANGPT and ANGPTL proteins, we tested recombinant Angiopoietins and ANGPTL proteins in binding studies with LILRA and LILRB family members (Figure 2 and Table 3). Figure 2. Representative Data Showing LILR and ANGPTL Binding. A: ELISA binding assay demonstrates Recombinant Human ANGPLT7 (Catalog # 914-AN) binding to biotinylated Recombinant Human LILRB5 with a Kd=4 nM.B: ELISA binding assay demonstrates biotinylated Recombinant Human ANGPTL3 (Catalog # 3829-AN) binding to Recombinant Human LILRB2/CD85d/ILT4 (Catalog # 2078-T4) with a Kd = 24 nM. Angiopoietin/ANGPTL Binding Screen with LILRA and LILRB Proteins8,10. ELISA screen of binding of LILRA1-6 and LILRB1-5 to Angiopoietins and ANGPTL3-7 proteins. 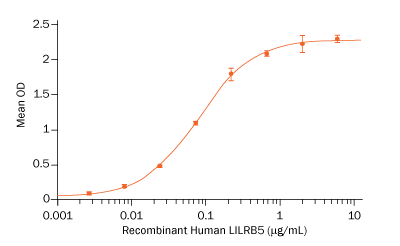 For this screen, recombinant human LILRA/LILRB proteins were coated on an ELISA plate, and biotinylated recombinant human Angiopoietins and ANGPTL proteins were used as ligands. Interactions between ANGPTL and LILRB2 protein were described previously.7 ANGPTL1 and ANGPTL2 were not included in that study.7 Typical data for such interactions are shown in Figure 2. Kang et al. (2016) Inhibitory Leukocyte Immunoglobulin-like receptors: Immune checkpoint proteins and tumor-sustaining factors. Cell Cycle 15:25. Hato, T. et al. (2008) The role of angiopoietin-like proteins in angiogenesis and metabolism. Trends Cardiovasc. Med. 18:6. Oike, Y. et al. (2005) Angiopoietin-like proteins: potential new targets for metabolic syndrome therapy. Trends Mol. Med. 11:473. Kersten, S. (2005) Regulation of lipid metabolism via angiopoietin-like proteins. Biochem. Soc. Trans. 33:1059. Zhang, C. C. et al. (2006) Angiopoietin-like proteins stimulate ex vivo expansion of hematopoietic stem cells. Nat. Med. 12:240. Tabata, M. et al. (2009) Angiopoietin-like protein 2 promotes chronic adipose tissue inflammation and obesity-related systemic insulin resistance. Cell Metab. 10:178. Zheng, J. et al. (2012) Inhibitory receptors bind ANGPTLs and support blood stem cells and leukaemia development. Nature 485:656. Anderson, K. J. & R.L. Allen (2009) Regulation of T-cell immunity by leucocyte immunoglobulin-like receptors: innate immune receptors for self on antigen-presenting cells. Immunology 127:8. Santulli, G. (2014) Angiopoietin-like proteins: a comprehensive look. Frontiers Endocrinol. 5:6. Lichterfeld, M. & Yu, X.G. (2012) The emerging role of leukocyte immunoglobulin-like receptors (LILRs) in HIV-1 infection. J. Leukoc. Biol. 91:27.